Our daughter and her husband and kids have been staying with us while they got on their feet. We had planned on them being here through at least next summer. They recently decided to move into his moms house to help her with her recovery from a medical emergency she recently went through. They have been here since last July, so just a month short of a year and a half. We enjoyed them being here, they were pretty easy to live with honestly, but having five people added to your house does make a difference. With them moving out this week, it frees up a lot of our house, from kitchen cabinets I lent them , to a large pantry I lent them, to the three rooms in the house they were using. They moved out last night, but mainly them, the few things going with them to his moms house and the pets. Oh, they have a huge dog and a huge cat !! The furniture and boxes will be mostly gone in the next seven days. The main impact this has on me is getting my huge studio room back that we gave them for their bedroom. My hubby and I have been crammed together, his stain glass studio and general tools, and my studio into a much smaller room . I will move into the big front bedroom next door, he will stay here. He loves this room, me, not so much. It is dark, and dreary and crowded. Now, in his defense, he is not in his studio as much, he loves the indented area he can build his bench into and he does not need the kind of light I need as I am in here most of my day many days a week. My new studio will be much bigger, no longer shared, which makes it even bigger,as we shared it before the kids moved in and were just about to move him into here , and has four big windows on two walls, and a french door overlooking our cute front porch. The current room has East facing windows so it is almost too bright in the morning, and then dreary the rest of the day. I am so thrilled to be able to get back into that room, I had just gotten it set up , after moving back to our house when they needed our help. It will be a few weeks until I am completely in there, but I am hoping to be able to start the move by the end of the week, or at the very least the next week. I do not think it will be an issue !! I know our puppy will love that room too as she can sit in front of that french door and look out at the street, something dogs always love to do !! So, 2017 will start out with me in a much more productive space. This one has kind of made me a bit depressed when I am in here. NO room to move, let alone work. It is dark, dreary. It shows in my work. Which is almost nothing lately. Listing is okay, but still, just not enough light, especially as it has been overcast a lot lately. Some days it is hard to get photos to list. On another subject. Just got a wonderful package in the mail. 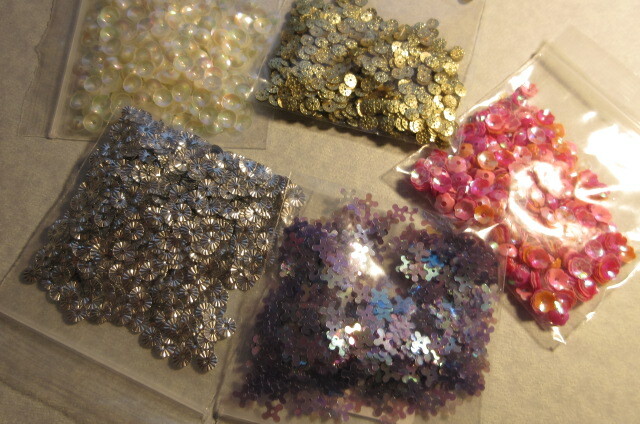 Even though I am selling a lot of stuff, I am keeping all my seed beads and all my personal sequins, which is a lot. I decided to allow myself 25 bucks a month to play and buy whatever I want. I found a new seller on Etsy and put in an order. I am thrilled with what I received and thought I would share them with you ! 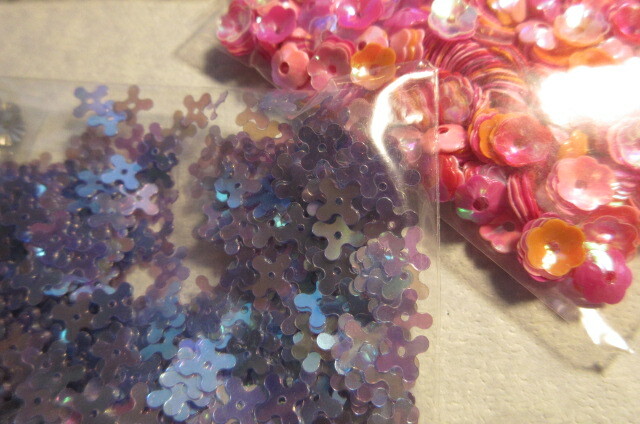 !I want to make sure to give a link to her shop, she has lovely things, so if you like what I bought, check her out, If you are into beads , sead beads, and sequins, you will be happy that you did, I know I will be back to shop again !! 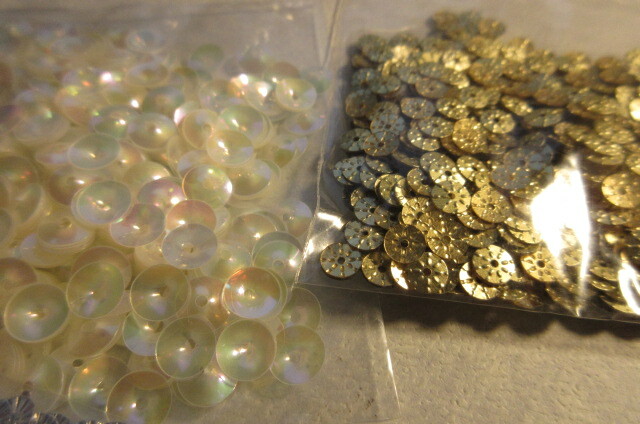 I had never seen completely round cupped sequins like these pearls, other than some metal ones I have from a garment I took apart. I also love the pinkish , orange flowers, that is one of my favorite seed bead colors and I have over a dozen different varieties of gorgeous seed beads in that color. 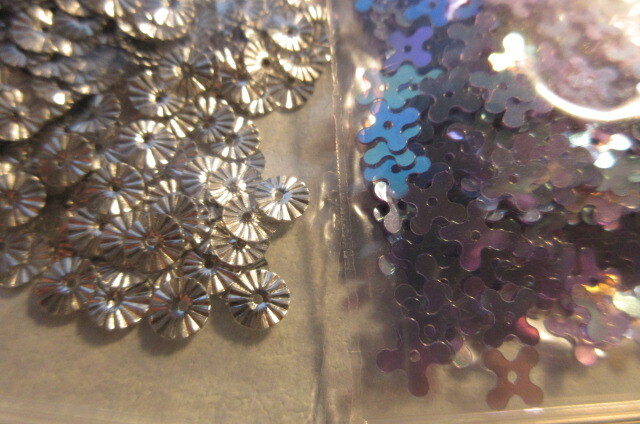 I was thrilled to add some sequins to that collection. The flat purple flowers were a gift from the seller and they are so pretty , perfect for layering !! 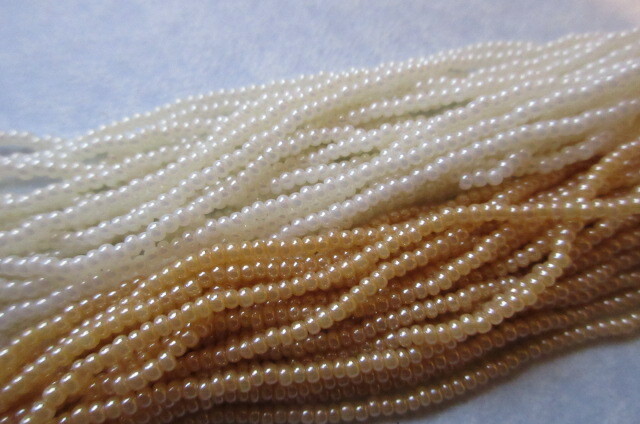 I love bead hanks. That is where I started. 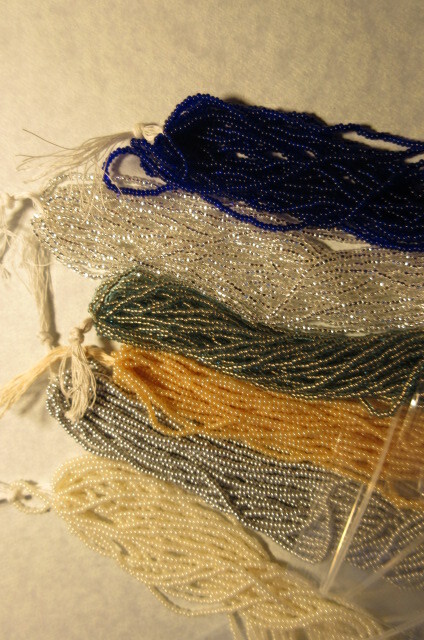 I had to buy all my seed beads back in the 80’s and 90’s in hanks. There were some tubes you could buy as well , but very few colors in the plastic bags at the craft store. They were also tiny amounts where the hanks gave you a good amount, thousands of beads in one hank, not just a few hundred in a bag. The amount of colors available today completely blows my mind. 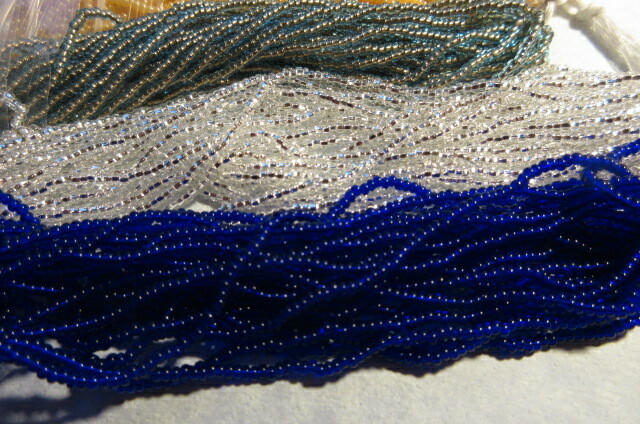 The first picture is three stunning seed beads. Top one is a copper lined aqua and they are just gorgeous. 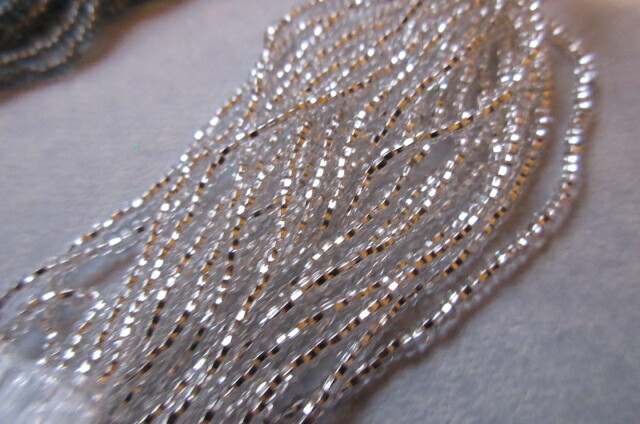 The silver lined in the middle are hands down, the prettiest silver lined clear I have ever found, and I have bought many silver lined clear seed beads in 25 years. These have a square hole, which I have never purchased before, but they are stunning. 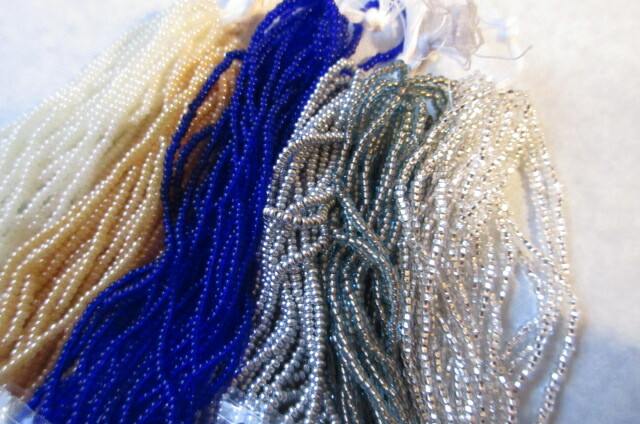 The third in this picture are the cobalt blue. Anyone who knows me, knows I adore cobalt blue. I absolutely love it. These are rich and gorgeous !! This is all six hanks. I just love the look of beads on the hank. I was so happy to find them !! I did not pull them completely out of the bags, so this is just part of each hank, they are much bigger than this. On average , I think they are about 4 thousand beads each. The pictures show about half the hanks. 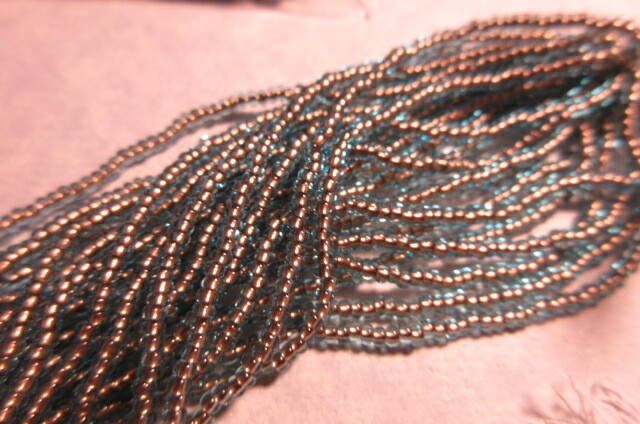 Here are the copper lined aqua close up. Just so unique and pretty. The silver are so reflective. I did not get a good close up of the silver, but they are so pretty . They are called bright silver , and they are. The pictures do not do the silver justice at all. Pearl off white, and the other is called deep egg shell. Weird names for both, but they are both just beautiful !! all six hanks. So pretty !! So, today I have to get the kids stuff packed up that is in my cabinets and pantry. At that point I can start moving stuff around and making more room in my cabinets. I have an order to pack today, which is exciting , and need to do some laundry and dishes. A full day for sure. I want to get in here and do at least a few listings today if possible. Tomorrow, we hope to get our Christmas stuff down as it is my hubbys days off on Monday and Tuesday. Monday I get him for most of the day,he has some chores around the house he needs to take care of, and Tuesday he helps the kids with the big move.A very busy week ahead, but exciting too !! He works wed through friday and then we have the weekend off to work some more. He works 12 hours the days he works, so nothing much can get done when he gets home from work. He has a few precious hours to relax before he heads to bed !! So, December will be a fun month, son coming in with new wife for the holidays, getting my studio set up, and of course Christmas !! Thanks for stopping by, I always appreciate it !! What do you have going on in December !!! ← Starting to take off !!! 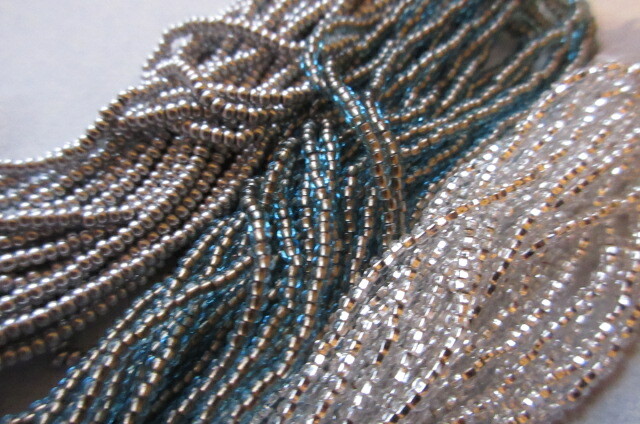 What shop did you purchase your seed bead hanks from? Very pretty. I should have put that in the post, so I will go do that, they certainly deserve mention !! The Etsy shop I purchased from was GSboutique !! !